Description: A rich, moisturizing, paraben free formula for extra dry and sensitive skin. and perfect for eczema and psoriasis. 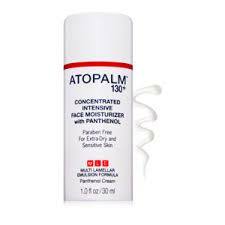 Atopalm 130+ Concentrated Intensive Facial Moisturizer with Panthenol is a gentle yet rich face cream designed to moisturizer and calm the complexion. Panthenol soothes stressed, uncomfortable skin while Atopalm’s patented MLE technology restore hydration by mimicking the skin’s natural lipids. The formula also prevents against future moisture loss, ensuring long-lasting comfort and hydration. Free of dyes, fragrances, volatile alcohols, and parabens, Atopalm 130+ Concentrated Intensive Facial Moisturizer is the perfect face cream for dry, sensitive skin. This is the perfect moisturizer for dry skin sensitive skin. The rich moisturizing cream is part of the Atopalm 130+ collection meaning it has 30% more active ingredients than the regular MLE line. This facial moisturizer for dry skin, sensitive skin or irritated skin should be applied to clean skin. This moisturizer for dry skin and sensitive skin is formulated using our patented technology and high quality ingredients. Perfect for extra-dry, sensitive skin types, Atopalm 130+ Concentrated Intensive Cream will leave the skin comfortable, calm, and perfectly moisturized. This facial moisturizer for sensitive skin should be applied as needed and with other Atopalm products. Ingredients: Water/aqua,glycerin, panthenol, propanediol, cyclopentasiloxane, cetearyl alcohol, sorbitan stearate, caprylic/capric triglyceride, squalane, glyceryl stearate, cetyl ethylhexanoate, stearic acid, portulaca oleracea extract, dihydroxyisopropyl palmoylpalmamide, olea europaea (olive) fruit oil, hydrogenated vegetable oil, phytosterols, sucrose cocoate, caprylyl glycol, 1,2-hexanediol, tocopheryl acetate, zinc gluconate, xanthan gum, tropolone, lavandula angustifolia (lavender) oil, sodium hyaluronate, tocotrienols.